Despite solid second-quarter earnings results, the computer peripherals maker delivered a disappointing outlook to investors. Shares of Logitech International (NASDAQ:LOGI) plunged 17.4% last month, according to data provided by S&P Global Market Intelligence. For perspective, the S&P 500 lost 6.91% in value. The maker of computer peripherals released a solid second-quarter earnings report on Oct. 22. 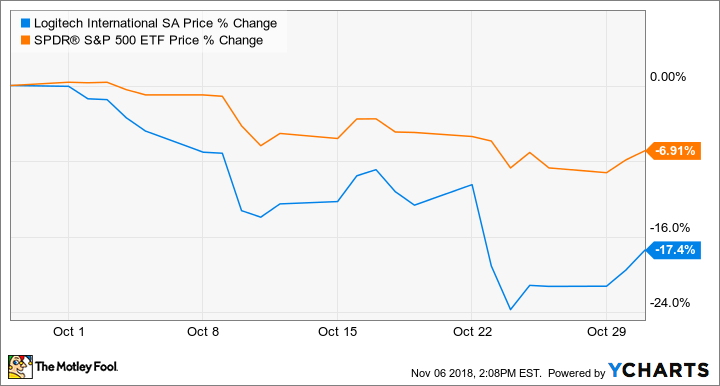 However, guidance fell flat with investors, which, along with an overall negative sentiment in the broader market, sent Logitech shares tumbling to close out the month. The Swiss-based company has experienced robust demand recently for mice, webcams, keyboards, and other computer essentials due primarily to a strong gaming market. Logitech reported revenue of $691 million and non-GAAP earnings of $0.49 per share, representing growth of 9% and 26%, respectively, over the year-ago quarter. Both revenue and adjusted earnings beat analysts' expectations. Logitech G Pro wireless gaming mouse. Image source: Logitech International. But with the shares fetching a high trailing P/E of 29.5, investors were apparently looking for those solid results to cause management to raise its outlook, which it did not. Instead, management maintained previous guidance for fiscal 2019 revenue growth of between 9% and 11% and non-GAAP operating income between $325 million and $335 million, representing growth of 15% over fiscal 2018 at the midpoint of guidance. Logitech has been a prime beneficiary of the esports boom. The gaming segment posted impressive growth of 41% year over year in the recent quarter and has become Logitech's largest sales category. The video collaboration segment also posted strong growth of 24% year over year, as the company continues to gain traction with organizations that need to upgrade conference rooms with video capabilities. Management believes Logitech has big long-term growth opportunities in both of these markets. The recent sell-off may just be a speed bump on the way to further new highs over the long term.